Tire cords are reinforcing materials used to provide dimensional stability to tires hence their demand corresponds directly to the expansion of the automotive industry. The global tire cords and fabrics market therefore gains substantial impetus from the rising demand for vehicles across diverse sectors. Being home to emerging middle-class population, the demand for automotive is comparatively higher in developing economies. On the flip side, the sale of automotive plunged considerably during economic slowdown in major developed countries. However, Transparency Market Research (TMR) expects it to gain momentum with fresh demand for tire fabrics and cords, post economic revival of the U.S. Bolstered by economic rebound, the sale of commercial vehicles and passenger vehicles surged across developed nation, thus boosting the global tire cord and tire fabrics market at 4.9% CAGR between 2015 and 2023. As per TMR analysis, the market, which stood at US$4.14 bn in 2015, is expected to reach US$6.37 bn by the end of 2023. Regionally, Europe, Asia Pacific, North America, Latin America, and the Middle East and Africa have emerged as the most lucrative markets for tire cords and tire fabrics. Among these regions, Asia Pacific accounted for the largest share in the global tire cord and tire fabrics market in 2014. Furthermore, healthy growth reported by the two-wheelers and automotive markets in the region will seal Asia Pacific’s dominance in the market even during the forecast period. As per TMR, the Asia Pacific tire cord and tire fabrics market is expected to surge at a CAGR of 5.4% during the forecast period. India, China, and Japan are expected to exhibit the most lucrative opportunities for vendors of tire cord and tire fabrics in the region. 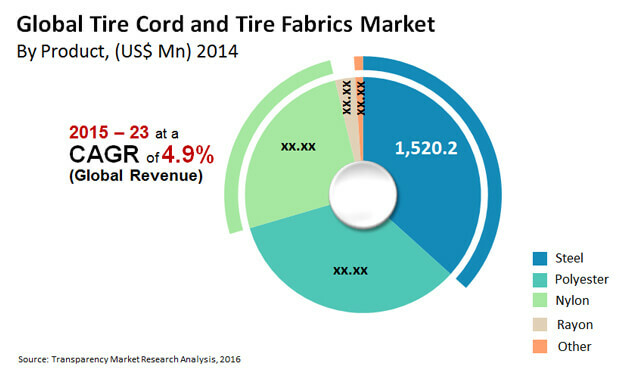 The Asia Pacific tire cord and fabrics market is expected to reach US$3,472.4 mn in 2023 from US$2,168.2 mn in 2014. During the same period, the market is projected to exhibit a CAGR of 4.7% based on volume. In 2014, North America emerged as the second-largest market for tire cord and fabrics. The U.S. accounted for the largest market share in North America, trailed by Mexico and Canada. Growth in sales witnessed in the region is significantly aided by the increasing demand for cross-over light duty trucks and large cars. The expansion of the personal vehicle segment in North America also contributed in positively influencing the tire cord and fabric sales in the region. Europe accounted for the third-largest share in the overall market in 2014. Demand for tire cord and fabrics is steadily rising in Germany, Italy, France, Spain, and the U.K. Akin to North America, Europe has been successful in achieving an increasing radialization of tires. This has augured well for steel and polyester tire cords despite the overall slow growth rate exhibited by the region’s automotive industry. By product, the steel segment emerged dominant in the market. As per TMR, the segment held over 58% of the overall tire cord and tire fabrics market in 2014. The steel segment is expected to maintain its dominance in the market through the forecast period. Besides this, the usage of polyester tire cord and tire fabrics is also expected to rise in tire manufacturing. During the forecast period, the demand for nylon tire cords is also expected to increase. As radial tires replace bias and cross-ply tires, demand for the steel tire cord segment is expected to increase in response. Radial tires have flexible sidewalls and ensures lesser fuel consumption by reducing rolling resistance, thus extending longevity of tires by producing lesser heat. These factors considerably contribute in boosting sales from the segment. Some of the most prominent companies operating in the global tire cord and fabrics market include Kordarna Plus A.S., Hyosung Corporation, Cordenka GmbH & Co. KG, SRF Ltd., Kolon Industries, Kordsa Global, and Tokusen USA. Market estimates for this study have been based on volume, with revenue being derived through regional pricing trends. The price of commonly utilized grades of tire cord and tire fabric materials has been considered, and customized product pricing has not been included. Demand has been derived by analyzing the production of different types of vehicles including personal vehicles, heavy commercial vehicles and light commercial vehicles, off-road vehicles, two-wheelers, and bicycles. Demand for tire cords and tire fabrics has been derived by analyzing the weight ratio of tire cord materials in relation to total tire weight of respective vehicle types according to regional trends. In order to arrive at volume consumption of tire cords and tire fabrics in each vehicle type, an average weight of tire was considered for convenience of calculation. The tire cord and tire fabrics market has been analyzed based on expected demand. The market data for each segment is based on demand volume and corresponding revenue. Prices considered for calculation of revenue are average regional prices obtained through primary quotes from numerous regional suppliers, distributors, and direct selling regional producers. Forecasts have been based on expected demand for tire cords and tire fabrics in product segments, primarily steel cords, polyester cords, nylon dipped cords, rayon cords, and others. We have adopted the bottom-up approach, considering individual product segments and integrating these to arrive at the global market. Product segments have been further divided using the top-down approach to derive the regional product market consumption. The study covers tire cord and tire fabric manufacturers. Unorganized sectors have not been considered due to unavailability of reliable data. The report provides detailed competitive outlook including market shares and company profiles of key participants operating in the global market. Key players profiled in the report include Hyosung Corporation, Kordsa Global, SRF Ltd., Kolon Industries, Kordarna Plus A.S., Cordenka GmbH & Co. KG, and Tokusen USA. Company profiles include attributes such as company overview, financial overview, business strategy, and recent developments.